I've been a "book eater" for as long as I can remember. Back in primary school, in 4th grade to be specific, I joined The Book Lover's club. It's not because I loved reading then. I just ran out of options. All we would do every club period was to go the library and to... well to be honest I really don't remember all that much. LOL! I do remember the librarian giving us tasks like putting books back on the shelves (obviously she didn't care about the Dewey Decimal System. Bad librarian!) and helping the library clerk update the list of overdue books (this was in the early 2000's so it was still pretty low tech). Being part of the club also had its perks - we get a 10 centavo discount off our overdue fine and we can borrow four books every week instead of three. SCORE! Since we didn't have much to do during club period, I often browsed the shelves looking for cute looking books. And by cute, I mean PINK. One one special occasion I borrowed a book about Prince William because I thought he was cute. And that book was my only exception to my "cute rule" Hey, I was still a kid then so I didn't know any better. Anyway, after going through books I came across a shelf filled with several books in the Sweet Valley High series. It had girls on it, and the cover had a lot of pink or pastel colors on it. I picked one of the books, sat down on the mat, and started reading. I was too young to understand what Sweet Valley High is really about. I was only 10 when I first read the series. Furthermore, I wasn't even aware it was part of a series. I'm not even sure I knew what a series was yet but I kept reading the books anyway. Even if I didn't read them in order, oddly enough I was still able to enjoy the books. Maybe because I was too young so I didn't read in depth. I basically enjoyed the books because I was in a hurry to grow up and the books introduced me to a world of teen drama that I hadn't experience yet or could not watch on TV because of parental supervision. I loved Elizabeth, didn't like Jessica as much, and discovered that the name Todd had a certain appeal to it. Even if SVH's premise was more or less the same with each book, I enjoyed reading them nonetheless. At home when my sister found out I was reading SVH, she told me to quit it. I was far too young to be reading about boys and parties and scheming around with your bestfriend. She had a point though, but of course I was too naive to see that. So to avoid getting scolded again I decided to try out a different genre. Way different. 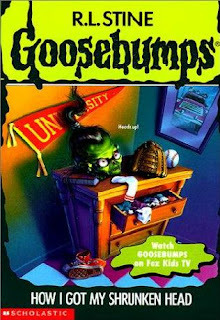 Maybe it was the colorful cover but I decided to give Goosebumps a try. This was probably the more age appropriate choice. I was a cowardly kid... still am today at 20 years old. But I read it anyway, because I would basically read anything at that point. I needed to read. So I read it and what do you know - I enjoyed it! I actually got so spooked out by it that I wanted to read more. Who knew horror stories can actually scare people? My love for horror books didn't last long though. I eventually got bored of the same spooky stories. Even if that was the case, I think trying out Goosebumps widened my book preferences. From then on I didn't limit my choices to just the books with the "cute" covers. I really scoured the shelves at the library in search of a book with a promising plot. How about you? Do you remember which book started your love for reading? It must be because you're older than me, but I didn't even know Sweet Valley High existed! I may have seen some, but I saw the covers and the topics and went "blegh" (I was a bit of a tom-boy). I had to get held back a year because I was born 5 DAYS OFF THE CUT-OFF DATE for school, so I had an entire year to do whatever. That's when my mum got be into reading. I think I was reading a whole lot of books at the same time, Junie B. Jones, The Magic Treehouse, Cam Jansen (the girl with the photographic memory) and A-Z Mysteries. There were loads of picture books thrown in there as well! This is a lovely discussion! It's really interesting to see how people's "reading career"s started! P.S.S. Have a happy holiday! I was always a big reader from the moment I was able to read on my own, but I'll never forget the day of a family trip from our house in the Washington DC area to Killington, Vermont. My mom handed me her copy of Victoria Holt's On the Night of the Seventh Moon. I was a dedicated Romance Reader, and writer, from that moment on. Historical, contemporary, paranormal, doesn't matter. The only real exception is Stephen King.